This week’s ASPI Suggests is blasting off in three…two…one…. 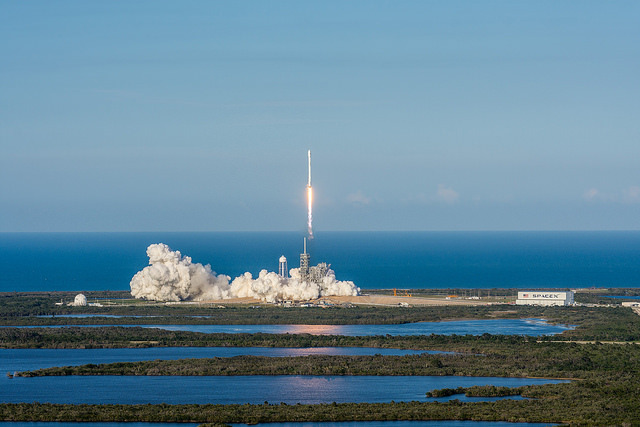 SpaceX gave a new meaning to reduce, reuse, recycle this morning, as it made history by successfully launching a pre-loved Falcon 9 rocket  into orbital space. If optimised, CEO Elon Musk believes that reusing rockets could lower launch costs by as much as 30% . The launch was live-streamed on SpaceX’s YouTube channel—watch it here  (coverage starts at 11 mins 50 secs). Hold tight for the launch crew’s cheers and celebration. SpaceX employees have every reason to be popping the champagne—this success brings them one step closer to Musk’s larger goal of colonising Mars, a plan which rests on a reusable rocket system that would mean spaceships could be used 12–15 times across a single trip . Here are three strong pieces that take the refugee experience from various angles. First, a look at Canada’s 12-month social experiment ‘adopting’ Syrian refugees —and what happened at ‘Month 13’. Second, a fascinating write-up on Sweden’s apathetic refugee children , who ‘seem to have lost the will to live’ after deportation plans are set in motion. And third, a wrenching story closer to home, that of a self-immolation last year on Nauru —the act and the fall-out. Let’s take a quick and important detour to salute Bob Silvers, the maestro behind The New York Review of Books, who recently passed away aged 87. Silvers, who founded ‘the paper’ in 1963 (! ), worked until days before his death  and has been lovingly remembered by a heft of the Review’s contributors . One of the kindest tributes is this touching reflection  in The New Yorker. CT mind Andrew Zammit headlines this week’s fresh research picks, with a brand new paper for Westpoint’s Combating Terrorism Center . In his report, Andrew holds a magnifying glass to the evolving threat of Australian jihadism. Sticking with the Asia–Pacific, a new report from the Center for American Progress  argues that the US, Japan and China should seek out areas of common interest in Southeast Asia. A fresh publication from CNAS  (PDF) details the west’s evolving understanding of Chinese thoughts on military escalation and escalation management, building on findings from a ground-breaking RAND report from 2008. And finally, after extensive polling, a new release from the Pew Research Center  looks at public attitudes towards cyberspace in the age of fake news and trolling. It’s not often we find ourselves directing Strategist readers over to Teen Vogue; in fact, this might be a first. But it likely won’t be the last, given the magazine’s emerging penchant for political/policy commentary . (Remember this cracking take, ‘Donald Trump Is Gaslighting America’ ?) Anyway, they’re back at it again, this time with a solid 101 on Trump’s nuclear weapons policy . As North Korea continues its quest to test the extent of the international community’s patience with its controversial missile tests, the Global Dispatches podcast gang recently sat down  (20 mins) with Kelsey Davenport, the non-proliferation policy director at the Arms Control Association. They discussed possible policy paths that the Trump administration could take to address the hermit kingdom’s aggressive ways, and the strategic intent behind the Kim regime’s testing of specific technologies. And while it’s not traditional Suggests fodder, we couldn’t go past the new podcast from the team behind This American Life and Serial: S-Town . The superstar producers have pulled a Netflix, with all seven episodes released simultaneously earlier this week. Expect the division between rural and metropolitan lives which so pertinently affected the 2016 presidential election to be central to this investigative thriller—and if we can’t convince you to check it out, maybe some of our  friends  can . For the last two decades, CSIS has hosted an annual health-check for the US–Japan alliance. For the 2017 round, an esteemed panel gathered in DC to talk about the latest report of the Mt Fuji Dialogue . It’s well worth a watch for anyone looking to get a handle on how distinguished Japanese analysts coming to terms with President Trump and how they hope to deploy some gai-atsu of their own (1 hour 56 mins). Melbourne: You’ve likely heard that Allan Gyngell, former head-honcho over at ONA, has a new book, Fear of Abandonment, coming down the line. While we’ll have a primer for you next week, you can also get along to the launch event at La Trobe Uni on 5 April, when the author will sit down for a chat with Fairfax’s Daniel Flitton. Deets here . Canberra: Head along to the screening of a brand new, eye-opening documentary, where senior military officials and veterans detail the importance of climate change to the maintenance of global peace and security throughout the 21st century, and how it can act as a catalyst for future conflict. The Age of Consequence will screen at ANU on 5 April , and is a must-watch for anyone passionate about climate change and/or US politics. Amelia Long is a researcher at ASPI and an editor of The Strategist. David Lang is an analyst at ASPI and managing editor of The Strategist. Image courtesy of Flickr user SpaceX.